What Happened to All Those Pirates? Lionel Wafer, who was immune from further prosecution for his piratical voyage, wrote a book about some of his exploits and his observations of the Cuna Indians, A New Voyage & Description of the Isthmus of America, published in 1695. The rare book section of the College of William & Mary�s Earl Gregg Swem Library contains a first-edition copy. Anthropologists and naturalists today still find Wafer�s observations useful. Meanwhile, William Dampier had finally returned from his harrowing voyage in 1691, so Wafer encouraged him to incorporate the story of the Batchelors Delight into his new book, A New Voyage Round the World, published in 1697. The College of William & Mary also owns an early edition of that work. A miniature portrait of the ship Batchelors Delight has been identified on an early eighteenth-century French map of the Americas, and another miniature portrait is on a period map of the Galapagos. Accurate depictions of specific pirate ships are extremely rare, which makes these two engravings all the more important. Wafer next stirred up enthusiasm in Scotland for founding a colony at Darien, Panama. The colony was not a success, but its very existence was a major cause of the parliaments of England and Scotland voting to merge into a single British parliament in 1707. Dampier made another voyage to Australia and New Guinea in 1699-1701 in command of the Royal Navy frigate Roebuck, and he returned with copious charts and information on the flora and fauna of the region. He went back to the West Coast of Latin America in 1703-1707 in command of the Royal Navy 26-gun frigate Saint George, accompanied by the 16-gun privateer Cinque Ports. This time, it was all legal, since England and Spain were officially at war—the same war in which England gained Gibraltar from Spain. During this voyage, the captain of Cinque Ports marooned crewman Alexander Selkirk on the island of Juan Fernandez off the coast of Chile, shortly before Cinque Ports sank with the loss of all hands; the pirates left there by the Batchelors Delight in 1687 had meanwhile disappeared. Selkirk�s experience served as the model for Daniel Defoe�s The Life & Adventures of Robinson Crusoe, published in 1719. Dampier sailed around the world a third time in 1708-9 as navigator under the command of Woodes Rogers, on two privateer ships, Duke and Duchess, and he managed to talk Rogers into picking up Selkirk to bring him back to England. He introduced him to Defoe. As for Edward Davis, he returned to Jamaica shortly after Port Royal had been destroyed by a devastating earthquake in 1692, and fell into piracy again. Jamaica was no longer a haven for pirates, so he sailed into the Indian Ocean. While there, he encountered former shipmate James Kelley, who had rediscovered the Batchelors Delight and been elected her captain. 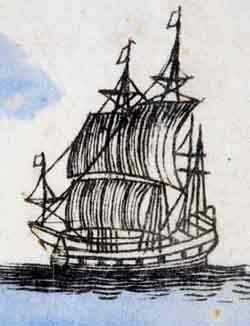 It is a fairly good bet that the Batchelors Delight, like many other pirate ships of the day, had spent many of the intervening years based at Fort Dauphin (now variously called Faradofay and Taolagnaro) at the southeast corner of Madagascar, and cruised among the Comoros Islands, the Seychelles, Reunion and Mauritius. Kelley and his crew, who were down to only twenty men by this time, had been apprehended by Muslim thugs near present-day Mumbai, India. The torture they had to endure caused the death of several of them. The ship was confiscated, and disappeared from history at this point. Davis and Kelley therefore thought themselves lucky to fall in with Captain William Kidd in 1698 at Madagascar (then known as Saint Mary�s Island). Kidd and his followers had decided to retire from piracy, but their luck had run out. Davis and Kelley would have been far better off if they had dropped in on Captain Giles Shelley of the 30-gun Nassau from New York, or Captain Thomas Tew and Captain William Mayes, Jr. of Newport, Rhode Island, who returned safely from Madagascar about this time into comfortable retirement. Kidd and his men sailed the large ship San Antonio back to Lewes, Delaware and then on to Boston, where they were all arrested, shipped to England aboard the 48-gun Royal Navy cruiser Advice in 1700, tried and hanged. Kelley had enough time before his execution to write a memoir of his activities, which was published as A Full & True Discovery of all the Robberies, Pyracies & other Notorious Actions of that Famous English Pyrate, Captain James Kelley. In it, he revealed that he had used many aliases, including James Gilliam, Sampson Marshall, and Gilliam Gabriel Loffe or Lawes.